Moniz, who has chaired the Physics Department at Massachusetts Institute of Technology, calmly took the ribbing for his erudition from motor-mouth host Peter Sagal and his comedian co-conspirators. But the jabs were mostly about his “California in the 1970s” long hair, which Moniz noted has been described as the “best hair in the Cabinet since 1794.” He wowed the panel by insisting that, though he’s not a “nerd,” he does get approached by strangers who are young scientists expressing their awe at his scientific achievements. 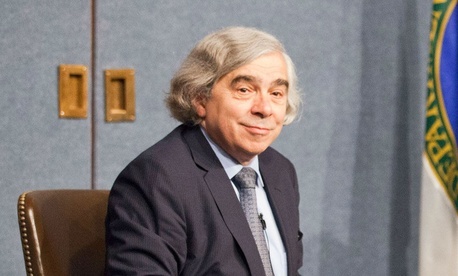 Moniz took the broadcast opportunity to educate the national audience by promoting the president’s climate change initiative, labeling solar as his “favorite energy source” and noting the Energy Department’s role since World War II (by predecessor agencies) in caring for the nation’s nuclear weapons. Sagal noted that Moniz’s predecessor on Obama’s team, Steven Chu, also appeared on “Wait, Wait…” four years ago. The current Energy secretary was then hit with three trivia questions related to the Sesame Street puppet character Bert, as in “Bert and Ernie.” Like Chu before him, he answered only one correctly.